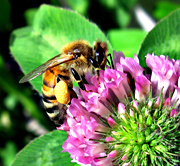 A honeybee on red clover. Bee keepers would get a tax break for buying more honey bees if a bill that cleared a committee in the Iowa Tuesday becomes law. The population of bees has dropped significantly across the country, sparking concerns about the pollination of crops. Just one member of the House Ways and Means Committee voted against the bill to exempt the sale of honey bees from the state sales tax. “First off, let me tell you I’m not a honeybee hater,” said Representative Jerry Kearns, a Democrat from Keokuk. According to Kearns, the state would be better off investing money in research to find out why bees are dying rather than offering a tax break. Iowa beekeepers manage about 30,000 colonies of honeybees. Experts estimate at least one-quarter of the food consumed in the U.S. can be traced back to a plant that was pollinated by a bee. Bees are dying at an alarming rate across the country. Some cite pesticides as the culprit while others point to mites that attack bee colonies. According to the latest data from the USDA, nearly a quarter of the honey bees in managed colonies died last winter. Data is not yet available for this winter.